Two Launches in One Day! Both Atlas V and Ariane 5 rockets went up recently. Both were equipped with rocketcams, but the weather was better at The Cape than in Kourou, so the Atlas launch’s lookback was really cool. 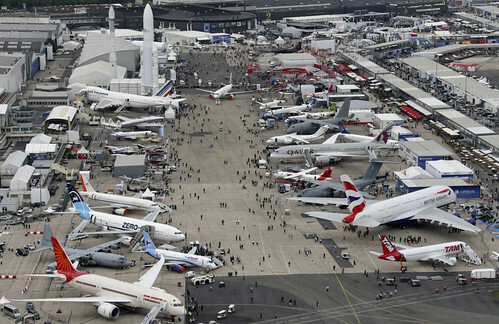 Naturally, Arianespace participates in the Paris Air Show and the swirling questions are related to a competitor who isn’t there: SpaceX. Their response is predictable and defensive, and with a billion euros at stake, can you blame them? There’s a real need for commercial launch services and well-run commercial satellite operators want to make sure there’s viable set of competitors out there. Spreading business around to Sea-Launch, Arianespace and ILS (Proton) helps keep them in business and assures the operators a way into space when needed. Commercial launches from Cape Canaveral were always preferred — both for location and reliability. The cost, however, made the bean-counters squirm. Reading the Reuters report by Irene Klotz about how there were no commercial launches struck me as naive. The U.S. Air Force reserved all the available launch vehicle manifests for Atlas and Delta in the U.S. for their payloads — not because of competition from foreign-based companies. Yes, there’s the cost factor. If you could save $20 million on a single launch by going to Kazakhstan or French Guiana, why not? One of the Falcon 9’s most potent arguments is that it is capable of carrying two all-electric-propulsion satellites at a time into geostationary transfer orbit. But according to the first customer of Boeing Space and Intelligence Systems’ all-electric 702SP platform, Satmex of Mexico, it will take the Satmex satellite about eight months to reach its final orbital position and begin generating revenue. Factoring in a longer orbit-raising into the overall spacecraft replacement cycle is certainly possible. Now, if only satellite operators start passing along these savings from simplified spacecraft design, lower-cost launch and cost-effective propulsion systems to lowering the cost of leasing bandwidth to customers remains to be seen.